"Find the time to do something you really love." That's the advice of MLC English and Literature teacher Barry Park, who also happens to be an award-winning director, actor and former 'Bookworm' on television. In January, Mr Park won two gongs at the Robert Finley Awards for West Australian Community Theatre. He was awarded Best Director for the controversial play M. Butterfly, which also won Best Play at the awards' ceremony. Mr Park anticipated some success for the production, which was also nominated for a costumes award. "It is a very challenging play, but I was working with an exceptionally strong cast and an experienced production team at the lovely Dolphin Theatre," Mr Park said. Both lead actors in M. Butterfly were nominated for the Best Actor Award, with Charles McComb, winning the award. "Charles very convincingly played a female Chinese opera performer who reveals himself to be a male spy for the communist government," Mr Park said. Mr Park, whose work as an actor and director is voluntary, is a longstanding committee member of the Graduate Dramatic Society (GRADS) at the University of Western Australia. GRADS specialises in presenting classic plays. M. Butterfly is a modern American classic which has won a Tony Award, the Drama Desk Award and the Outer Critics Circle Award. Mr Park sensitively combined elements of the original score with instrumental sections from the opera Madam Butterfly to emphasise the parallels between the two stories. Members of Perth's Chinese community gave Mr Park valuable cultural advice and choreographed the spectacular Chinese opera and Agitprop sequences. Mr Park says he was encouraged to join GRADS by Marilyn Tsoulakis, who was Head of English when he joined MLC. He says he is grateful for the continuing support of his colleagues and students. Originally from Rhodesia (now Zimbabwe) Mr Park worked in theatre, television and radio, as well as teaching, before moving to Australia in 2000. "I spent every Saturday filming Bookworm for ZTV in 1979 and 80," he said. "Those were the days of live television. You arrived at the studio, costumed and made up, and then the cameras rolled. If anything went wrong, you had to keep going!" 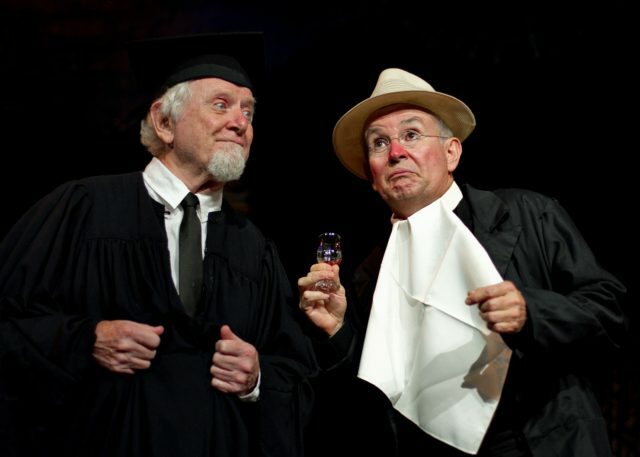 Mr Park had the eponymous role in the show, playing a "grumpy, old bookworm who shared stories with children who visited the attic where he lived." Mr Park has performed at the Edinburgh Fringe Festival and in London. Showing his versatility, he has performed in dance shows and pantomimes, as well as in plays by Shakespeare, Chekhov, Goldsmith and Shaffer. He has also directed classics such as Arthur Miller's Death of a Salesman and All My Sons and Tennessee Williams' Cat on a Hot Tin Roof. His next venture for GRADS is Andrew Bovell's Speaking in Tongues, one of the Australian plays celebrating UWA's centenary. As a member of staff at MLC, he credits the College with encouraging both staff and students to maintain a work-life balance. "I really encourage everyone to use their individual gifts for the benefit of the community. You must always find time to do the things you really love. It gives you a wonderful sense of fulfilment."